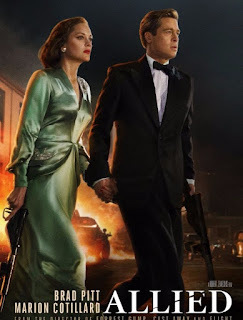 Allied stars Brad Pitt and Marion Cotillard and is directed by Robert Zemeckis (Forest Gump, Cast Away, Flight, Back to the Future films), off a script by Steven Knight (Peaky Blinders, Taboo, Seventh Son). That's one hell of a combination of talent! 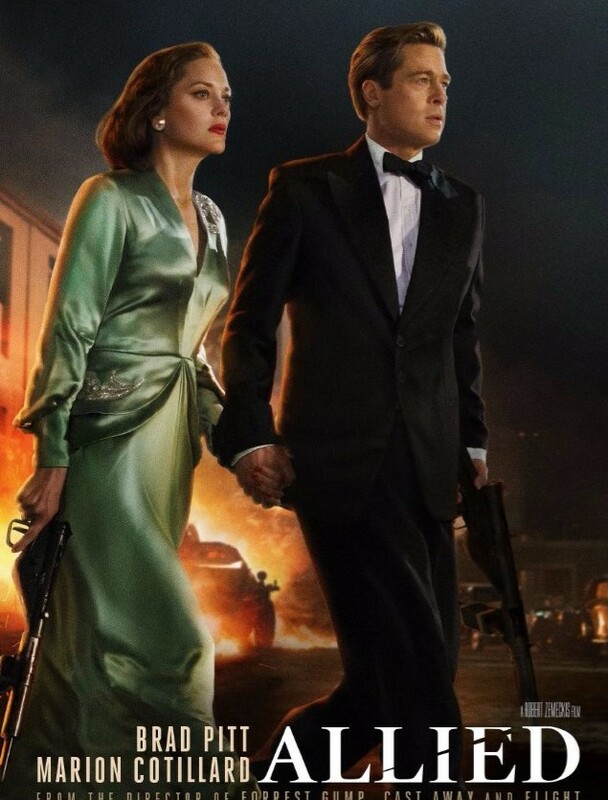 In 1942 two World War II operatives, a Canadian intelligence officer, Max Vatan (Brad Pitt), and a female French Resistance fighter, Marianne Beauséjour (Marion Cotillard), join forces in North Africa on a deadly mission behind enemy lines to assassinate a political power figure. During the assignment they never reveal their true identities to each other while they play the part of a fake married couple. During the preparations for their task, while acting the parts and realizing they barely have a chance to survive this mission, they QUICKLY fall in love and afterwards, Max asks Marianne to join him in London and marry him. All in the hopes of leaving all that double-dealing behind them and start new lives. After a few months, when they reunite in London, they marry, have a child and settle into the happy married family life. But then their relationship is tested by the pressures of war once again as suspicion and danger envelop their lives and marriage as Max is given some terrible news that forces him to investigate his wife, testing his loyalty for country and the love for his wife. They truly love each other as we watch Max deal with this potentially lethal test that has global consequences. The film starts with us watching Max land in North Africa and meeting Marianne, who has spent a considerable amount of time establishing their relationship to everyone around them, so when Max shows up, arriving from this "travels for work," all he has to do is meet the neighbors and peers within their social circles and act the part of loving husband. The first act takes the time to establish mostly everything we need to know, and watch as they prepare and execute their assignment. But the pressures of war and the job break down their toughened exteriors with each other and after the assignment, Max asks her to come to London with him and marry him. Apparently the cover took! The film takes a few liberties and jumps through time a little bit. The first story jump is three months as we watch Max's military bosses approve Marianne coming to London, and his peers warning him that relationships born on the field of war never work. Our second time jump is about one year later, and we are quickly shown their happy lives of husband, wife, child and the neighbor-nanny. It's quite the idyllic life. And then Max receives a phone call that perpetuates the second half of the film, and the harrowing third act. This is an unusual film for me considering I'm more the popcorn film kind of guy, but when a good film shows up, there I am apparently. This is not a foreign film, but since it takes place in North Africa, our spies tend to speak French and other languages among their targeted groups, so we get some subtitles for some of the first act of the film. But at least the subtitles are a decent, easy to read size and not distracting. The visuals for the different locations throughout the film are pretty stunning or detailed. There's great care taken to set the scenes. There was one very unique moment where they make out in a car, in the desert, in a sand storm, that pulls you into the intimate private moment created by a force of nature. The first half of the film is story establishment that is done very well but when Max is called in to his bosses offices, in a very official and tense meeting, where he learns he has to put his wife to the test to determine if she's a German spy, the anxiety and tension in the film ratchets up quickly. Act three of Allied is intense. Max is asked to only set up Marianne with a test, but he can't just do that. He needs to prove to himself and his bosses she is not a German spy. His efforts are admonished as he is reminded to go home and act naturally, but every test of his has it's consequences. Consequences of which, I will leave for you to discover. The public scores for the film include IMDb (7.1/10), Rotten Tomatoes (60%), & Roger Ebert (4/4). I'm not sure what nitpicking the RT crowd is doing to net Allied a 60% but I thought this was a well done film that kept me curious, engaged and then absorbed by its story, much like any good film should do. I had no issues if I would have dropped money on this film. It was free for me via my Amazon Prime membership, making it another worthwhile notch for having Prime.